Tucked away between shopping arcades in the heart of Kyoto, Nishiki Tenmangu Shrine is one of my favorite places. 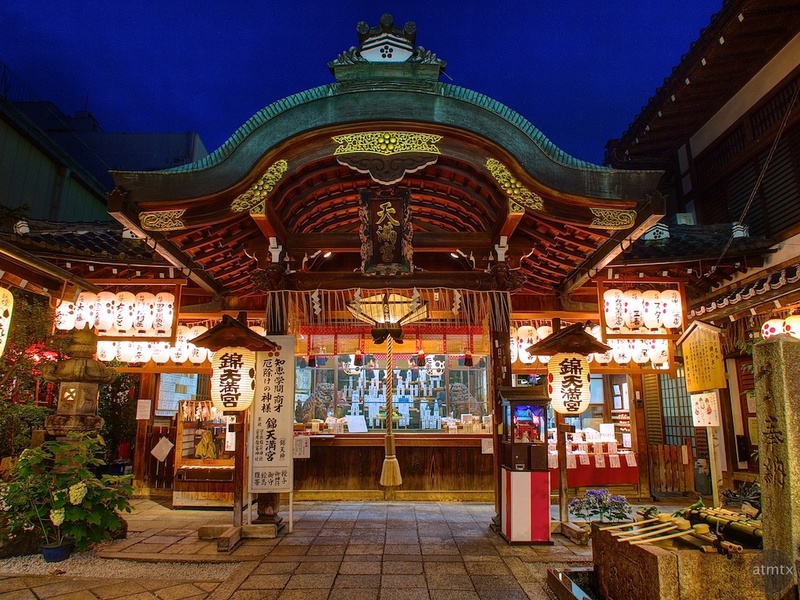 It’s not as famous as some of the other temples and shrines in this historic city, but it surprises with its unexpected location. I happen to catch it during blue hour, that magical time right before sunrise or after sunset. I’m not much of a morning person so I shoot most of my blue hour images in the evening. I waited for a break in pedestrian traffic, in order to catch it without any visitors. Worthwhile, if you didn’t want the motion blur of people ruining pristine long exposures. I shot the three image HDR back in 2012 with the Olympus E-P3 with the Panasonic 14mm f2.5 plus the wide-angle adapter. Part of my new Technicolor Collection.